We raised a husky with a kitten! haha. But really we found that he was very very gentle with the cat and she was vicious when she played with him! He would be patient and just swat lightly at her and never once attacked her even when she clawed his nose. I've had huskies and a tiny terrier at the same time - they were ever so gentle with her, she was the one who went too far at times. My present dog was raised in a house where there were two adult males aside from his mother and the rest of the litter. No need to keep a 24/7 watch over the small dogs - they are all in the same pack now and will get along 99% of the time. 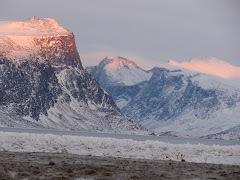 "here in the Baffin Inuktutuit is more common than in the western part of the territory."